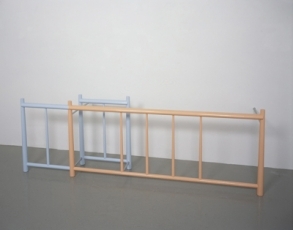 Richard Rezac, Untitled (04-04), 2004, Painted wood and aluminum, 20.5 x 19.75 x 3.75 inches. Rhona Hoffman Gallery is pleased to present the second solo exhibition of recent sculpture and drawings by Chicago-based artist Richard Rezac. Intrinsic to most or all of Rezac’s newer sculptures is a more definite incorporation of two, sometimes three, contrasting materials and forms within a single object. Rezac achieves this with color juxtapositions: each color, solid in application but distinguished in value or hue, offsets the different forms; and with overt material differences, which offer a physical separation while simultaneously integrating the combination. 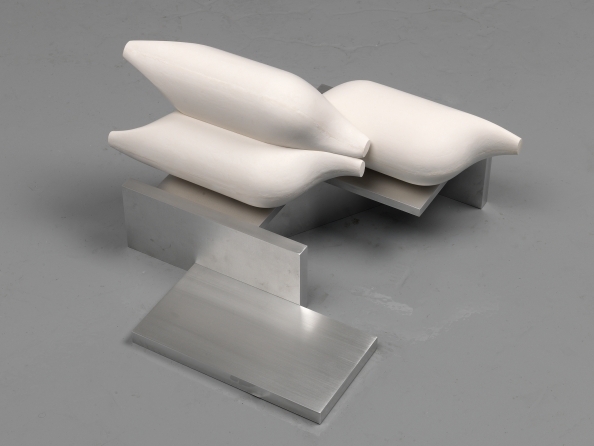 Rezac’s sculptures are constructed in various materials including welded aluminum, cast bronze, cast plaster, nickel-plated bronze, and painted wood. The conception of Rezac’s sculptures begins with drawings which allow him time and opportunity to formulate his personal ideas and style. Some of the fully realized drawings are included in this exhibition. This spring Richard Rezac received the coveted Rome Prize from the American Academy in Rome. Concurrent with this exhibition is a solo exhibition at the Portland Art Museum, titled Richard Rezac: Sculpture and Drawings, 1998–2005. Rezac’s work has been exhibited at numerous other venues including Yale University Art Gallery, New Haven, CT; the Museum of Contemporary Art, Chicago, IL; Artgarden, Amsterdam, The Netherlands; Corcoran Gallery of Art, Washington D.C.; and the Aspen Art Museum, Aspen, CO.